New book, 48 pages, MAA332. The French 'invasion by stealth' of her uneasy ally Spain, and the final proclamation of Napoleon's brother Joseph as king, led to the spontaneous outbreak of a war of resistance in May 1808 that would rage for six years. Despite Napoleon's clear advantage, the Spanish Army was never completely destroyed, their stubborn resistance typified by epic sieges at Zaragoza and Gerona and nationwide guerrilla warfare. 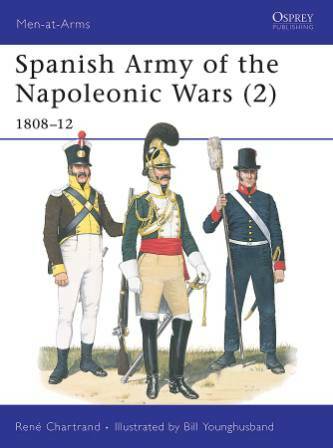 The second of three volumes, this book examines the history, uniforms and equipment of the Spanish Army who, with the help of guerrillas and 'armed peasantry', stood up to Napoleon's Grand Army against all odds. Contents: Resistance and British Aid; Uniforms and Equipment; Guerrillas; Regional Volunteers and Armed Peasantry; The Navy; Select Bibliography; The Plates. This item was added to our catalog on Monday 30 June, 2014.